Authors: Victoria Wise, Susanna Hoffman; Format: Paperback; ISBN: 9780894803642; Publisher: Workman Publishing; Release Date: 1990; Length: 301 pages. Condition: Like New. Very gently used, so cover, binding, and pages are all still in excellent shape. Same cover design as that shown here. Like a blank canvas but much tastier, the ubiquitous corn or flour tortilla is the perfect vehicle for every sort of food. And taco-making--the art of filling tortillas with dozens of zesty and unexpected concoctions--turns the ordinary into the irrepressible. Victoria Wise and Susanna Hoffman, both life-long tortilla aficionados, fill them with Fiesta Ground Beef, Chicken Mole, Spicy Shrimp Salad, Green Olive Cilantro Salsa, Rancho Chili Sauce, Pear Lime Salsa, and much more. Here are over 200 recipes for well-filled tortillas. Tacos from around the world: Portuguese-style Grilled Fish Tacos, Oriental Stir-Fry Beef Tacos, and Thai-Style Shrimp Tacos. Add variety to the spice of such Cal-Mex favorites as Basic Beef Fajita Tacos, Black Bean Tacos, Chorizo Tacos, Snapper Vera Cruz Tacos, and Tacos de Carnitas. Dessert tacos and tostada sundaes bring the most festive food into the most festive course. 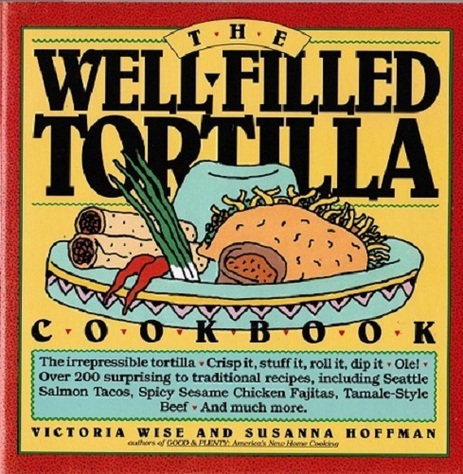 Whether store-bought or home-pressed (the recipes are here, for corn and flour), a stack of tortillas means delicious, down-home, fun food for any occasion...to eat with your fingers in messy splendor.